ARTHROMEDICUS COMPLEX - Food supplement – is a mixture of substances from 11 herbal species. 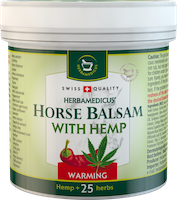 The original recipe of this preparation was developed in the Herbamedicus laboratories. The recipe also includes glucosamine and chondroitin – the basic components of the joint apparatus. ArthroMedicus contains a balanced complex of herbal extracts and a combination of body-natural substances. Glucosamine and chondroitin are structural components of joint cartilage, ligaments and tendons. Gelatin is a rich source of amino acids which form the basis for recovery of connective tissues (cartilage, ligaments, skin). 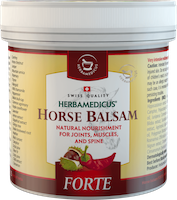 The herbal complex is based on a traditional Swiss herbal recipe. In its products HERBAMEDICUS (external link) (new window) exclusively uses herbs whose effect has been proven with hundreds of years of experience and documentation in herbariums. Horsetail contributes to maintenance of the normal condition and elasticity of vascular walls. Echinacea purpurea supports natural body protective systems. Ginseng root supports the natural body immune systems. Ginkgo tree – the leaf contributes to mental balance. Silybum marianum seed has positive effects on the liver functions. ARTHROMEDICUS is very easy to use; take one capsule every morning and evening. There are different capsules for day and night and they are distinguished by different colours. According to the experience of those taking dietary supplements with glucosamine and chondroitin, after about one week of use the supply of nutrients may induce a subjective feeling of impairment which usually recedes within several days and is replaced by a feeling of a more permanent improvement after two weeks of use. It is recommended to repeat the cure at least twice during one year to maintain good health. Green capsule – evening: glucosamine sulphate (555 mg), chondroitin sulphate (40 mg), edible gelatin hydrolysate (5 mg), capsule edible gelatin. Food supplement. Keep out of the reach of children. It is not recommended for children, breastfeeding and pregnant women. The product is not intended to replace a varied diet. Do not take more than the recommended daily dose. Store in a dry place. Protect from direct sunlight and do not freeze!